GlamourDance: Heel Protectors: To Use Or Not To Use? Heel Protectors: To Use Or Not To Use? 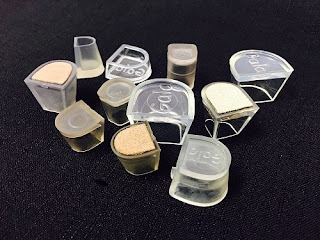 Heel protectors will make a difference to the way you dance, and are compulsory on most competition dance floors as well as many dance studios. Protect pristine dance floors from being scratched. Heel stoppers come in varying sizes to fit the shape of each heel, such as stiletto, slim, contour or flare. After years of coming across all sorts of weird and wonderful heel shapes, we are proud to have expanded our range of heel protectors to cater for most heel types for your dancing comfort. It is still highly recommended that you show us your dance shoes to see what works best, as there are so many variations to be considered. To your happy feet!